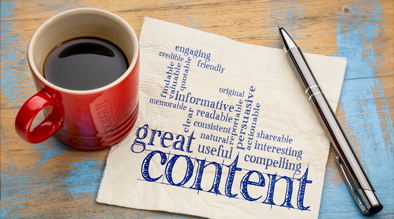 The mantra “Content is King!” is a fundamental tenant in search engine optimization. It includes not only the best keyword optimization but also the strategic usage of user sentiment for each page. But how exactly do you structure the page? In this article, use this wireframe to display just enough to get your point across without overoptimizing your content. Each page has 3 sections: Exposition, Story, Climax. Header (aka H1) – This should grab attention, and explain what the content of that page is about. Do not add fluff. It should be phrased simply and clearly. Introduction paragraph – Allow the user to emotionally connect. That could be done by setting up the scene. Identify the problem or the need of the customer. Make a promise that your hotel can solve that need. Set the tone – The voice of your content needs to match the market position of the hotel. For example, don’t sound whimsical or romantic if you are an airport hotel catering mostly to business travelers. Content must be scannable and engaging. You have about 3 seconds to do all of this. Body content – This goes in deeper with the introduction paragraph. 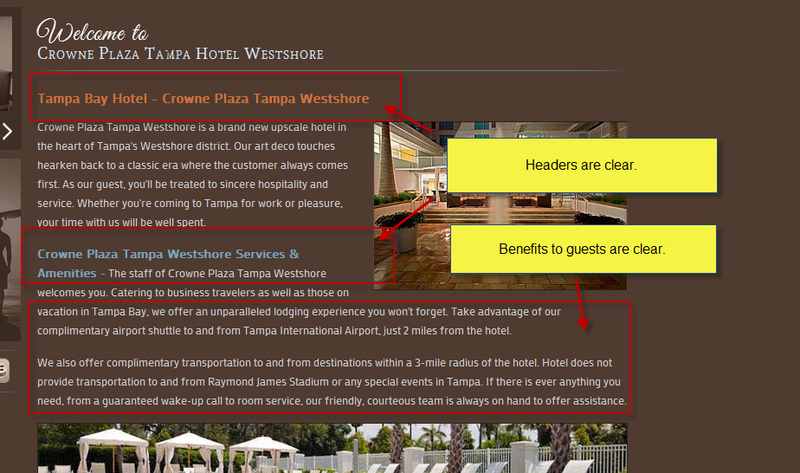 Intensify the problem and how the hotel can meet the need by showing proofs, benefits and features. Do not talk about features without explaining how the guest will benefit from them. You have about 7 seconds to do this. Body content – As long as you set up the exposition and the story well, the guest should say yes, I want to book even before they get to your call to action. Change your tone – Create a sense of urgency, value and immediacy. You have about 3 seconds to do this. 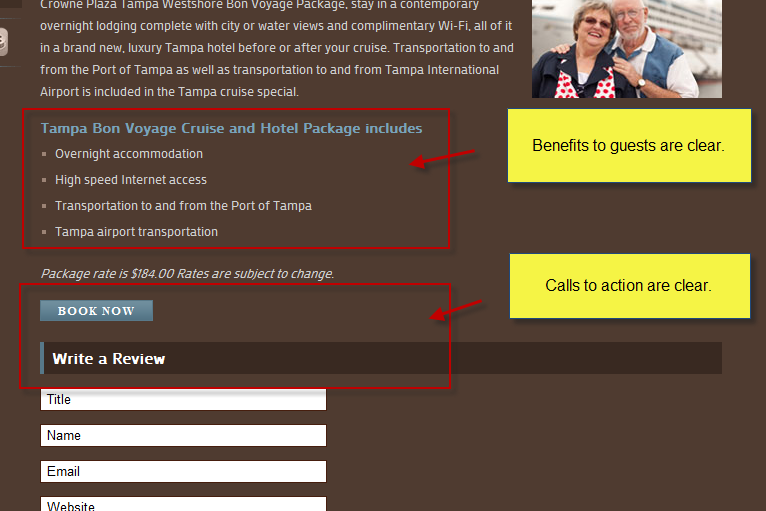 All website pages have just seconds to turn a visitor into a booking. Just like how you would talk to a person on the phone or in person, website content needs to sound casual and get to the point fast. Content needs to be clear, have a purpose, and organized in a way to sell to show how the guest will benefit. Any other extraneous content is useless to the guest, and will hinder chances for conversion.